All posters listed here can be printed as either A4 or A3. Some posters are available for purchase from us as professionally printed A3 size posters. 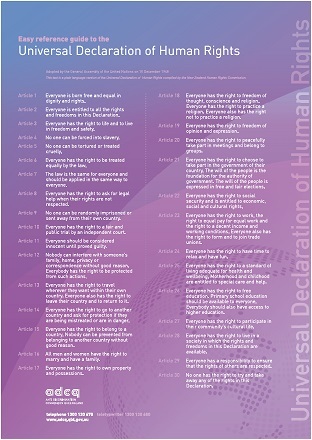 Download the Human Rights 2018 (colour) poster as A4 format: print friendly (PDF File, 3.4 MB) . Where, after all, do human rights begin? Discrimination can be against the law. Download the age-friendly workplaces poster as A4 format: print friendly (PDF File, 2.6 MB) t.
Poster text reads 'Age-friendly workplaces are welcoming and inclusive of all ages and abilities'. Download the age-based stereotypes poster as A4 format: print friendly (PDF File, 2.9 MB) . Poster text reads 'Mentally healthy workplaces are as important as physically safe workplaces'. Poster text reads 'Stigma leads to discrimination isolation and exclusion'. Poster text reads 'Flexible workplaces are strong workplaces'. No matter how beautifully you write it, discrimination is ugly. Download the No matter how beautifully you write it... poster as A4 format: print friendly (PDF File, 78.7 KB) . Download the No matter how beautifully you write it... poster as A3 format: print friendly (PDF File, 78.7 KB) . Diversity: our difference is our strength. Download the Diversity: our difference is our strength poster as A4 format: print friendly (PDF File, 6.6 MB) . Download the Diversity: our difference is our strength poster as A3 format: print friendly (PDF File, 6.6 MB) . Don't be a tool! Sexual harassment is against the law. Download the Don't be a tool! poster as A4 format: print friendly (PDF File, 1.7 MB) . Download the Don't be a tool! poster as A3 format: print friendly (PDF File, 1.7 MB) . A fair go. It's the Queensland way. Download the A fair go. It's the Queensland way. poster as A4 format: print friendly (PDF File, 44.6 KB) . Download the A fair go. It's the Queensland way. poster as A3 format: print friendly (PDF File, 44.5 KB) . Discrimination is so last season. Don't wear it! Download the Discrimination is so last season. (female) poster as A4 format: print friendly (PDF File, 1.7 MB) . Download the Discrimination is so last season. (female) poster as A3 format: print friendly (PDF File, 1.7 MB) . Download the Discrimination is so last season. (male) poster as A4 format: print friendly (PDF File, 2.4 MB) . Download the Discrimination is so last season. (male) poster as A3 format: print friendly (PDF File, 2.4 MB) . Warning: a lack of diversity may be harmful to innovation. Download the Warning: a lack of diversity may be harmful to innovation poster as A4 format: print friendly (PDF File, 803.3 KB) . Download the Warning: a lack of diversity may be harmful to innovation poster as A3 format: print friendly (PDF File, 803.2 KB) .